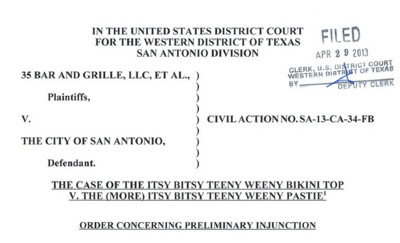 More specifically, the plaintiffs sought an injunction against the enforcement of a San Antonio ordinance that required their dancers to wear more than before, but the court denied the request, finding that the plaintiffs' First Amendment challenge was not likely to succeed. The opinion (by the chief judge of the court) is highly amusing, even if you aren't a particular fan of the double entendre, of which the opinion is chock full. I especially enjoyed the entirely irrelevant mention and picture of "Miss Wiggles," an exotic dancer who apparently performed (fully clothed) at the Eastwood Country Club in San Antonio in the 1960s, and who according to the court has recently passed away. A close second to the memory of Miss Wiggles was the historical note, which I have confirmed, that from 2005 until December of last year the relevant San Antonio ordinances referred to the sort of businesses in question here as "human display establishments." They are now perhaps more accurately, but much more boringly, called "sexually oriented businesses."